Top of the morning to you! What better way to start your day than on a slow moving catamaran on Punta Cana’s little slice of the Caribbean Sea. It’s your vacation and it’s your time in the Caribbean. Let us provide the boat and make this experience unforgettable! This is not your typical morning... You’re in Punta Cana, it’s warm, it’s sunny and we’re taking you for an AM excursion out on the water. Good morning! Yes, so you board your catamaran right from the beach. Our crew will introduce themselves but most likely you’ll only remember the bartenders name. It’s ok this happens. Then we pop the sail and head east to one of Punta Cana’s offshore reefs. Jump in! We provide the snorkeling gear and one of our crew will guide you through the coral for the best spots to see the area’s vibrant sea life. Don’t want to snorkel? No problem. Chill on the boat and hit the open bar. If you snorkel you’ll have to wait until you’re done to have alcohol. Decisions, decisions. To snorkel or not to snorkel, that is the question! Anyway, the snorkeling is amazing and then we open the bar! Enjoy free flowing beer, rum, soda and water. Get your drink at the bar or have one of our crew bring it to you. Hungry? Not a problem. Enjoy chips, salsa and fresh local fruits. Alcohol and snacks, it’s really a beautiful thing. Your captain then takes you south past some of the area’s resorts and Punta Cana’s stunning coastline to what many feel is the highlight of the excursion - the Natural Swimming Pool! So, we call it the natural swimming pool but in reality it’s a sandbar, well off the coast, with waist deep water. And the truth is… it’s awesome! Let me set the scene here. You’re wading in warm transparent tropical waters that only reach your waist. Our crew brings out the floating open bar. The music of your choice is pumping. You’re backdrop is a palm-tree-studded beach. Then you wake up. No just kidding! This is reality and we want YOU to experience this reality with us. 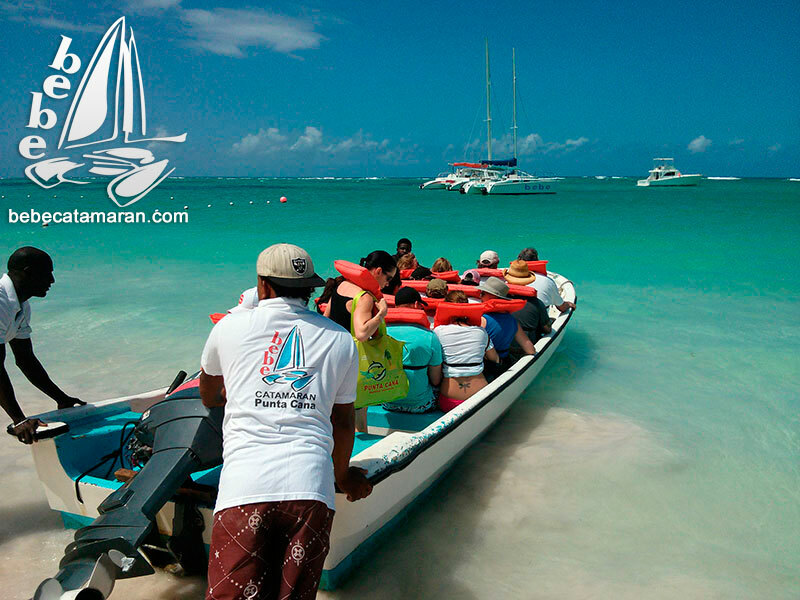 If you’re an early riser or if our morning excursion simply fits your schedule better, join us on Bebe Catamaran AM. It’s not a good morning. It’s a great morning!